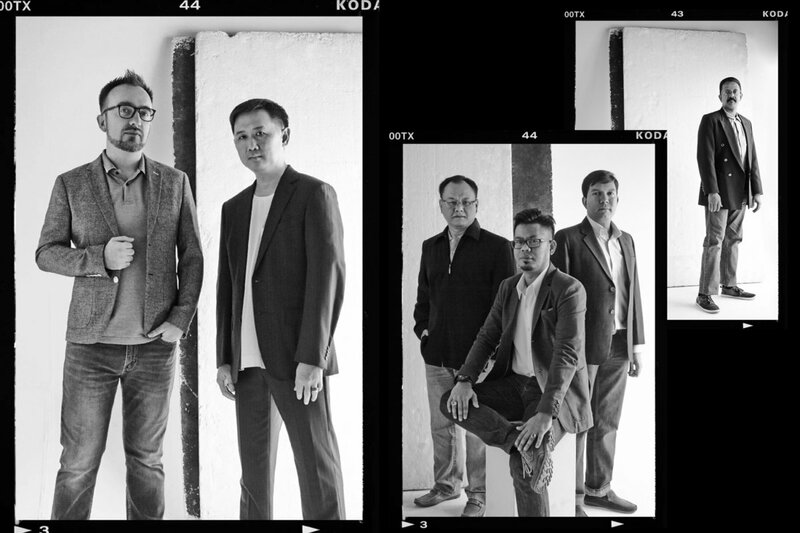 This is what it looks like when bitcoin geeks pose as models for Men‘s Folio on May 16, 2018. Cryptocurrencies – everything you do not understand about money combined with everything you do not understand about computers. They, and the innovative technology that allows them to exist, have been around for almost a decade now, but it is only recently that they’ve become fashionable beyond the finance bros who will not shut up about it. We seek out the people of interest in Malaysia to help make sense of the scene. How did you get into the crypto scene? Anuar Yahaya (AY): My journey started in 1999 when I worked as a technical assistant, much of it revolved around IT. I have a deep belief and passion for technology and design, and throughout my career, I’ve tried to be involved in efforts to use technology to improve life and advocate good design in perfecting solutions in every challenge. I’m now working on building UNiQ Exchange to become a key crypto exchange in Southeast Asia. I’ve been crypto mining for some time, and have received some crypto through games as well. This developed into a major interest as I began trading crypto in 2013. I consider myself to be a long-term investor; for me, short-term investing is much more difficult and a lot riskier. Ahmad Suhairi (AS): My explorations in blockchain technology started in 2016 when I was looking for new solutions in the field of cybersecurity. I started some research through YouTube videos and Internet articles, and attended blockchain conferences and community meet-ups to gain more knowledge. Navin Danapal (ND): I’ve always been a fan of emerging technologies, and I got interested in Bitcoin years ago when it was seen as having no future. If you read science fiction, you’ll realise that many fantasies become realities. When I discovered blockchain-powered crypto and how it could be applied beyond finance, I got involved. What’s a common misconception people have about cryptocurrencies? AY: Crypto remains mysterious to the average person, leading many to associate it with scams and money laundering, two illegal activities originating from within the fiat currency ecosystem. The public needs to understand that crypto is based on digital technology; the only way to overcome the misconception is to learn about it. Before 2015, there was little knowledge and information about crypto available, unless one was in the relevant communities. Things have changed now, and there is abundant information about crypto available in layman’s language on the Internet. All that’s needed is time and interest! AS: The reason for the misconception that it’s a scam or get-rich-quick pyramid scheme is because of the large number of crypto-related “investment” companies that work on binary, networking or multi-level marketing platforms that cheat people of their money. ND: People think that you can become rich from crypto. Sure, if you had a lot of it in the past and you sell now, you could. But there’s also a limit of how much you can sell by converting that to fiat money. Are you just keeping crypto to use where accepted or for future use? People are rushing to exchange fiat for crypto to trade, or buying mining gears and crowdfunding server farms. Some will profit, some will also burn from the process of jumping on the gold rush. Do some homework. There’s also the misunderstanding that crypto is a scam, no thanks to MLM and some e-wallets that lend a bad name. Like all new tech, there’s more noise than truth; you should understand the technology or not get involved. Which crypto projects do you find most interesting? AY: I’d have to say UNiQ Exchange. There are a host of platforms to choose from today, but not all are created equal. The list is based on user reviews, as well as a host of criteria such as user-friendliness, accessibility, fees, and security. We’re committed to safe and secure trades because, at the end of the day, you’re trusting your money with us. We understand that and take it seriously. We also maintain a pretty amazing ledger. AS: Our UNiQ Exchange project is the one that’s closest to my heart due to the amount of time, commitment, resources, and collective experience we’ve put into it. Furthermore, it’s also the product of a series of consultations and guidance from both our strategic partners and global blockchain experts. Our continuous engagements with regulators and authorities in countries that we’re physically present in, as well as online, help ensure that all areas are covered and that every stakeholder’s interests are well-protected too. ND: For me, it’s blockchain applications that revolutionise industrial usage beyond finance, because it allows existing industries to leverage on the advantage of the blockchain to open new doors not possible before. It’s hard not to get carried away and apply blockchain technology to everything (even when it’s not required), simply to have it as that isn’t innovative. What’s the public attitude towards crypto? Rene Bernard (RB): Unfortunately, many perceive Bitcoin and other crypto as a get-rich-quick scheme, or even worse, as facilitating Ponzi money games. The initial idea behind the decentralised trust model for running a value transfer network without distinct government involvement has been neglected by the masses. This realisation will come when the world understands the power of Bitcoin as an international settlement instrument or perhaps even as a kind of reserve “currency” one day. Colbert Low (CL): Cryptocurrencies burst onto the scene back in 2009 when Satoshi Nakamoto released the core wallet for the public to download. I believe cryptocurrency systems will spawn the new generation of payment and identity systems when humans go beyond our solar system. The typical man on the street may be warming up to the notion of crypto – there are crypto events in Kuala Lumpur almost every week as of early 2018 – but a lot of people have this misconception that crypto is a scam or get-rich-quick pyramid scheme. This is exacerbated by malicious actors who try to deceive the public. How do you cope with the fast-evolving crypto regulations? RB: I’ve stopped following the regulations of countries where I don’t live in. My focus is Malaysia; I’m doing my best to advise and support exchanges, business citizens, academia, and government bodies in aspects relating to crypto and blockchain. This includes technology and economics. CL: Bank Negara Malaysia has published a list of nine cryptocurrency exchanges in Malaysia that have been registered as a reporting institution (RI) with the regulator. This follows the issuance of the paper entitled Anti-Money Laundering and Counter Financing of Terrorism Policy for Digital Currencies (Sector 6) in February 2018. What advice would you give to someone who’s interested in dabbling with crypto? RB: Do your own research. Don’t follow only one “guru”. Question what are the interests of anybody attempting to drag you down this rabbit hole. Very often, people try to rip others and benefit from newbies’ lack of expertise. CL: Attend as many events as possible and use online resources to understand the risks and services provided by players in the market. Do not put all your resources in one basket. My awareness of blockchain technology came about in 2014 when I was lecturing on intellectual property law for my forensic computing students at the university I’d worked at previously. The specific area was on privacy issues, private key, and public key. As I was preparing for the class, I stumbled upon Bitcoin and cryptocurrencies. Researching further, I got to know that the technology behind it was blockchain and that cryptocurrencies were just the tip of the iceberg. In addition to my lectures, I started talking about blockchain and crypto with my family, friends, and business circles just to create awareness. It began my journey into the world of blockchain technology, primarily, and crypto, secondary. Not many were interested like I was at the time until Bank Negara Malaysia started mentioning fintech and blockchain. I attended a few blockchain conferences as a participant to gain more knowledge, and as they say, the rest is history. Many people think that Bitcoin is the same as blockchain and that they are a scam. Crypto assets (my reference to cryptocurrencies) are merely one part of the technology; the blockchain could be adopted into areas like banking, energy, trading, healthcare, insurance, supply chain management, and even forecasting, to name a few. The only reason for this misconception is there are a large number of crypto-related “investment” companies out there that work on binary, networking or MLM-type platforms to cheat people of their hard-earned money, and the only example these companies use is Bitcoin and its growth. For many, it is difficult to buy Bitcoin as the price has gone up many folds. Hence, when people see a new crypto, they believe that they are buying the next Bitcoin and that they are going to become millionaires in the next few years. In the crypto world, red flags involve introducing new members to invest, holding funds for a period of time, interest rates that are too good to be true, and member-get-member in some networking platforms. My advice is simple. Get a thorough knowledge before even thinking about dabbling in it. Try to avoid scams or too-good-to-be-true types of “programmes”. Talk to people like us with better knowledge and experience. Don’t fall for the hype. Learn about blockchain technology and its history first. Attend Bloktex events. Be a risk-averse person.